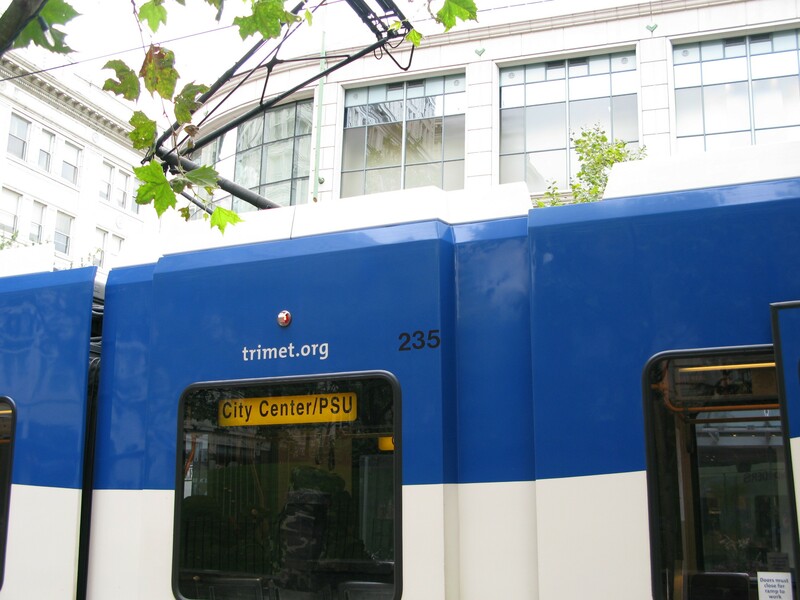 Lots of interesting tidbits in TriMet’s October Performance Dashboard. MAX ridership has gone down, no big surprise since there’s no more free rail zone so people won’t necessarily wait for a train to get from one point downtown to another if a bus shows up first (or if they just walk…) What is surprising is that despite service cuts in September, there are more people riding buses than this time last year when there was comparatively more service. WES is doing marginally better, but at $11.69 cost per boarding ride and an essentially flat graph, it’s nothing spectacular. Ok, if we’re serious about this whole “Safety is a value, not just a priority” and that’s not just a catch phrase to try and look good, then this warrants a long and hard look. 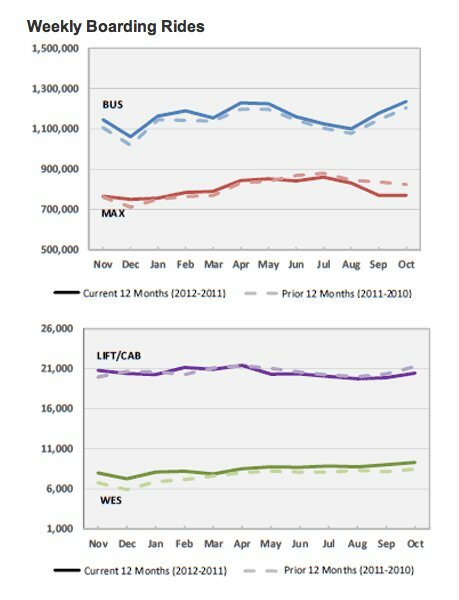 Bus collision rates have been consistently higher (with 2 exceptions) than last year for the past year. 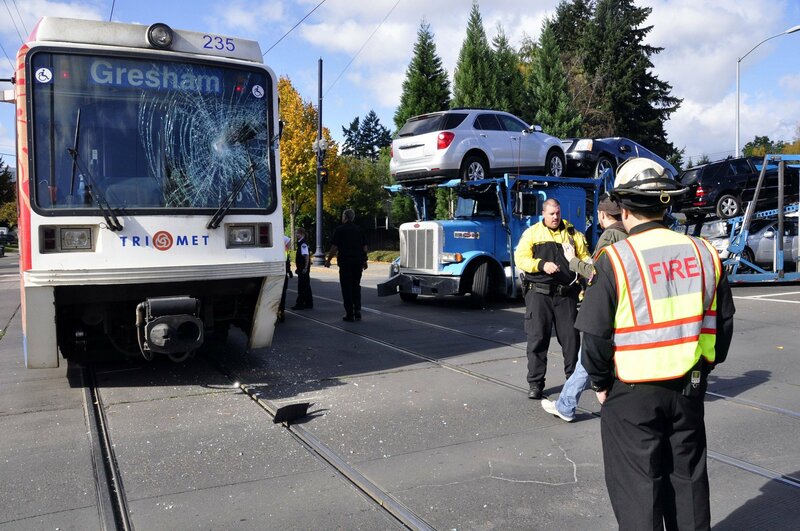 After the Sandi Day incident, TriMet head of training Allen Morgan developed an annual bus operator recertification training program, which theoretically would reduce the number of bus accidents. Well it’s a wonderful idea, but it doesn’t work. Or maybe it does work but it’s the initial operating training that isn’t adequately preparing new drivers. Or maybe there’s just too many new drivers at once due to the hiring freeze. Whichever it is, this trend of increasing collisions needs an immediate response, and not just a safety committee that’s all talk and no action. And so it doesn’t look like I’m just picking on bus and leaving rail alone: Even though it’s not one of the graphs presented in the dashboard, let’s take a look at rail rule violations as well. If there’s a similar trend, then we need to stop seeing how many times we can fit the word “safety” into a speech and actually do something to improve safety. I’m no financial analyst, so maybe I’m looking at this all wrong, and if I am, feel free to correct me. But after that whole panic attack about TriMet having somewhere between $12-17 million budget shortfall… it looks like the actual revenue is almost $16 million over the budget for FY 2012, and about $3.5 million over for FY 2013. Even taking into consideration the passenger revenue chart which shows the budget being slightly higher than the actual (about $2.3 million for FY 2012 and $1.1 million for FY 2013), it doesn’t look like we were anywhere near being short – if so I would’ve guessed that the actual would be under the budget, or perhaps taking the recent cuts into consideration, about even. Instead it appears to be well over. What’s the story? 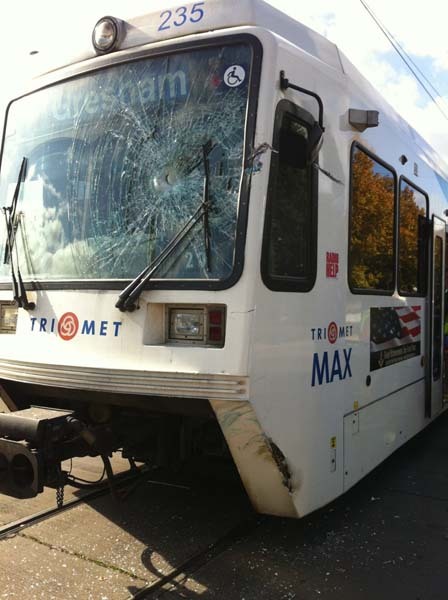 Note: I first started writing this post about a month ago when a trespasser was hit by a MAX train just east of Sunset TC, but I didn’t get around to finishing it. 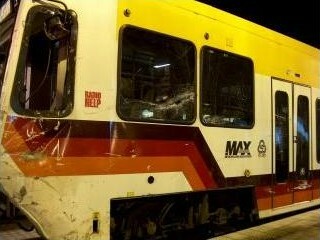 After a person committed suicide by MAX train this past evening, I thought I should finally get this posted. 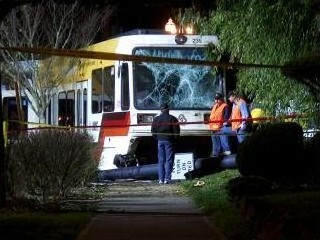 After April 2010, when a TriMet bus driver made a left turn into a group of five pedestrians killing two and seriously injuring a third, one of the recommendations made to TriMet was to change the language used to describe this and other such events – using the word “incident” rather than “accident.” The thought behind this is that the word “accident” implies nothing could have been done to prevent it, no one is at fault, it’s just a terrible thing that happened, whereas “incident” (or sometimes “collision” or “crash”) is more of a neutral term to describe that something happened, but without placing blame on or absolving responsibility from either side. The problem I have is that this language isn’t really neutral either. “Incident?” Fine. “Pedestrian?” Hang on a second now, this happened east of Sunset TC, where there are no walkways or sidewalks nearby and trains travel in dedicated right of way at high rates of speed next to a freeway. Yes, I get it that “pedestrian” means “person on foot”, but no one is casually going for a stroll where this occurred – you have to either climb over a fence or a jersey barrier to get to the tracks, and if you do that, you are a trespasser. You are deliberately entering a dangerous area you have no reason or right to be in. Allegedly this person was also suicidal, which certainly has a different spin than just “pedestrian.” I don’t think it would be inappropriate for a service alert to identify a person as just that – a person. 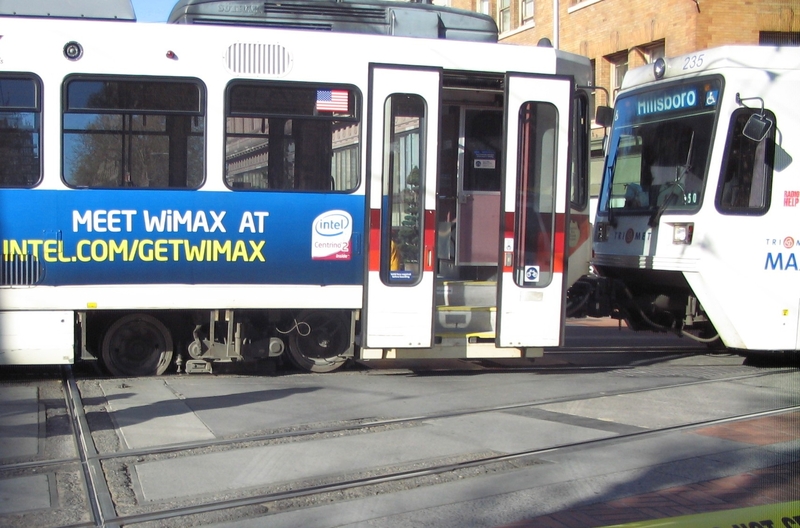 To that end, I thought TriMet’s wording of the service alert after the recent fatality (train and “person”) was an improvement as far as keeping the language neutral. Painting MAX as a danger to pedestrians has been a sticking point for me with that list of MAX fatalities that makes the rounds in all MAX safety (and sometimes funding) discussions. The compiler of that list makes the bold claim that “MAX kills people at 248% the rate of cars” which, even though I’m no math wizard, I realize is basically saying “MAX kills people at a little more than twice the rate of cars.” This was calculated assuming that the MAX death rate per 100 million passenger miles is 1.14, and the car death rate per 100 million passenger miles is 0.46. And where do these numbers came from? Well, according to the source at the bottom of the list, the 0.46 car statistic apparently comes from page 47 of Portland State’s: “Second Annual Portland Metropolitan Region Transportation System Performance Report.” I Googled that so you don’t have to, and provide page 47 below. That’s how we roll here at MAX FAQs, we’re happy to help. 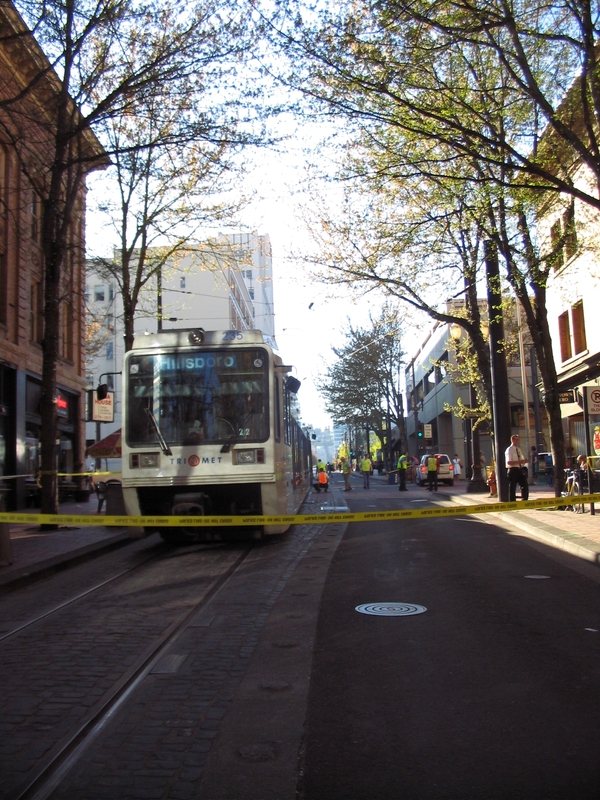 No idea where 0.46 deaths per 100 million miles traveled comes from – MAYBE that lowest spot on Portland’s line in 2000? But the number listed as the national rate is 1.75. 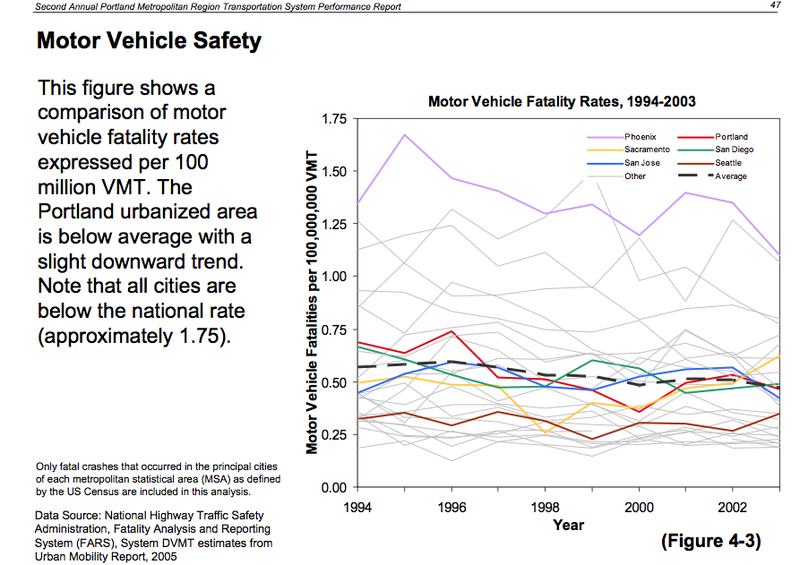 I don’t know, saying the car death rate is 0.46 and pointing to this as evidence sure seems like cherrypicking the data. Walking through the cut east of Ruby Junction? TRESPASSING. Being in a restricted area between Goose Hollow and the tunnel entrance? TRESPASSING. Walking in the right of way along the Banfield? TRESPASSING. The recent climbing a fence into the ROW along 26? Not a fatality, but definitely TRESPASSING. And all of these are avoidable on the part of the person trespassing! Detail isn’t provided for all of the fatalities in the list, but the ones that aren’t blatantly trespassing in areas not meant for pedestrians fall into the themes of ignoring crossing gates and other warning signs, or running for a train in one direction without checking for trains in the track in the other direction. Meaning – they were PREVENTABLE on the part of the person who got hit. And yes, several of them have been from suicidal people who know that getting hit by a train can be a very effective way to end your life. You could possibly make the argument that this is a shortcoming on availability of mental health help, but this is not a shortcoming of MAX or a flaw of rail safety. Maybe you think I’m being too judgmental of people who were either suicidal or just not paying attention and paid the ultimate price for it. But from my perspective, I have pretty much no sympathy for people who make rail operators unwitting accomplices to their deaths or injuries. 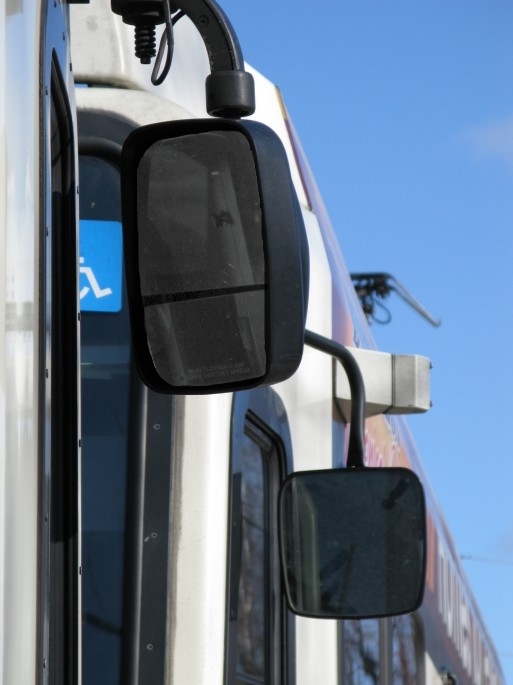 I’ve seen the effect that hitting a person has had on several operators – resulting from suicides, trespassing, or or not bothering with basics like looking both ways. Many of those operators were able to return to work, but some end up having to leave rail because of how traumatic it was for them. I mean, not a single rail operator goes to work thinking “Gee, I hope someone uses me to kill themselves today!” For the people who don’t intend to kill themselves but get hit by a train anyway, it’s really hard to work up the sympathy for the “victims” who put themselves in that situation in the first place. On top of that, I’ve seen more near-misses and more instances of people being outright stupid around trains than I can count, so perhaps I’m somewhat jaded and pessimistic. Near miss at 122nd & Burnside (reader-donated video footage, pre-2009) Doubt these women were suicidal, but they’re very lucky after doing something so stupid. Theoretically a good idea, right? Which is great and all, except for the people who make a concerted effort to NOT use them. I have REPEATEDLY seen people try to squeeze along the tactile strip on the outside to cross, even though since there’s no room to balance there this takes significantly longer than just walking around the railing like you’re supposed to. 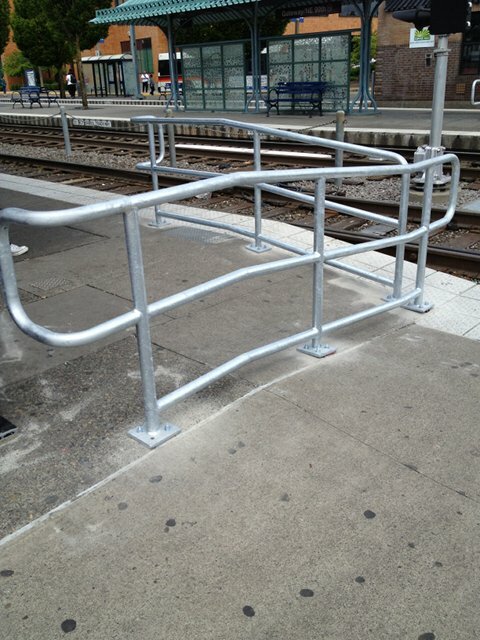 Here at Gateway and other platforms that have installed these sorts of railings to channel people to safely cross, I routinely see people climbing over them instead of walking around. What do we have to do? Put TriMet employees out there as escorts to hold everyone’s hand at platforms to make sure no one walks in front of a train? I’ve seen people vault over these, miss, and land hard on the platform. When inevitably someone vaults over it the other way and lands in the trackway as a train is coming in, what are we going to call it? 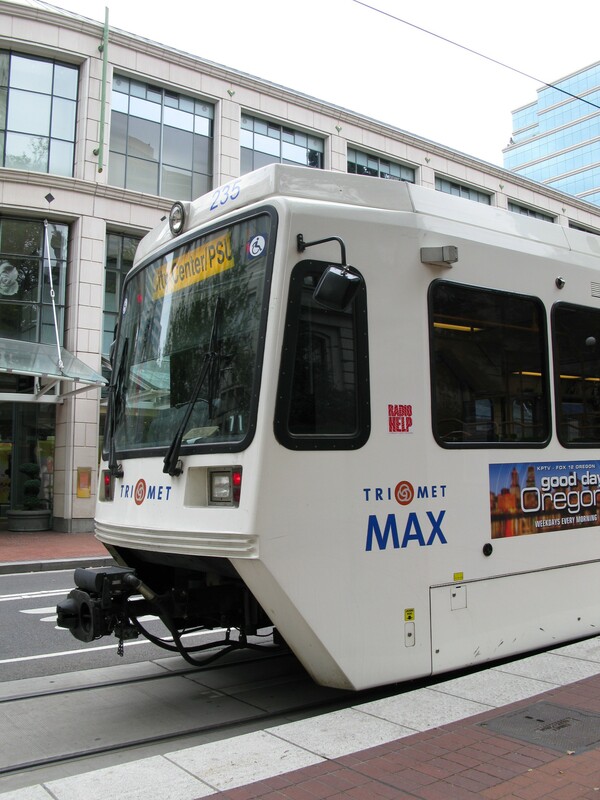 An “incident between a train and a pedestrian?” Or my preference, which would be “an incident between a train and a dumbass” but that’s pretty much why I’m not allowed to write any official TriMet statements. If you don’t want to get hit by a train, it is not difficult to avoid it. If you are bound and determined to get hit by a train, sadly it’s not difficult to do that. So if you get hit by a train, it doesn’t seem like you were particularly interested in not getting hit by one. Trains move in a predictable pattern. They will not leave the rails and come after you. If you don’t want to get hit by a train, wait for crossing signals showing a walk symbol, look both ways before crossing railroad tracks, wait when you see crossing gates coming down or a train passing through, and stay out of areas that tell you not to trespass because trains run through there, and you will be fine. Please do this, because *I* don’t want you to get hit by a train. BUT, trains are heavy, don’t stop quickly, and cannot swerve. If you trespass in areas where operators have no reason to expect a person to be, disregard crossing gates, signals, and “Don’t Walk” signs, or play chicken with a train, it’s very difficult for something that big and heavy to stop in time to prevent a collision. It’s unfortunately how physics are going to work. As for the last two incidents of MAX hitting a person, the first was an alleged suicide attempt, the second apparently was confirmed as a suicide since investigators found his suicide note. Maybe we need to put up suicide prevention signs in some areas of the alignment like bridges have (does anyone know how effective those are? I have no idea). One lucky cyclist. And by lucky, I mean an idiot. 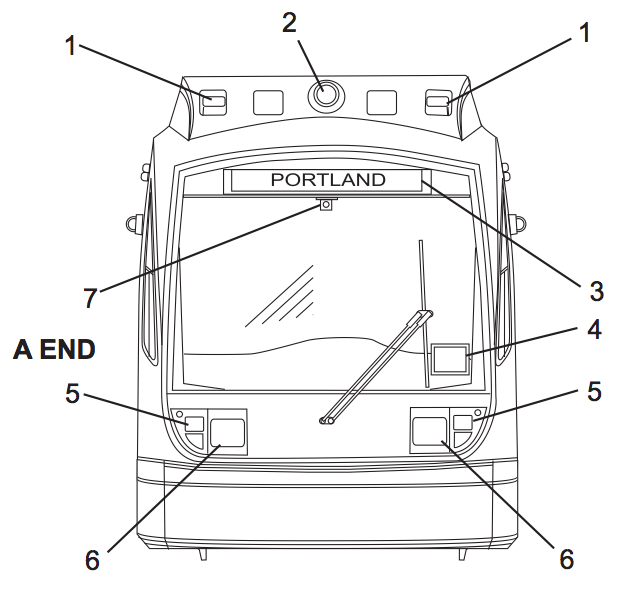 Last week, a cyclist on Burnside nearly got hit during the classic one-two-punch where a train in one direction blocks the view of a train going the other direction. The good news is, if you obey traffic signals including crosswalk signs, you run no risk of being hit by a train in a situation like that because you will have a red light and a “don’t walk” sign. Unfortunately, this doesn’t work if you’re a dumbass who ignores warning devices. This is also unfortunate for three passengers on the train who sustained minor injuries as a result of the the hard stop caused by the operator using emergency braking to avoid the cyclist. 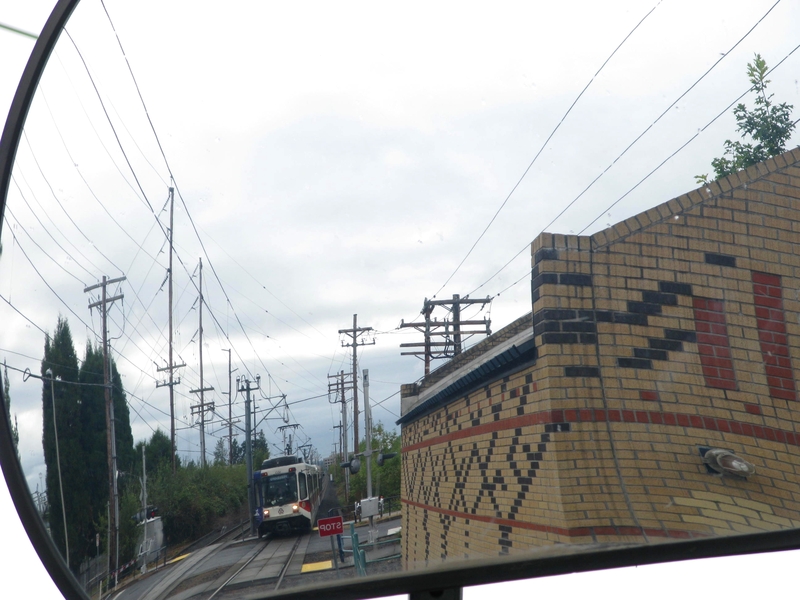 The story was picked up by the Oregonian, complete with video from the train, as the Type 4s have nice forward-facing cameras. 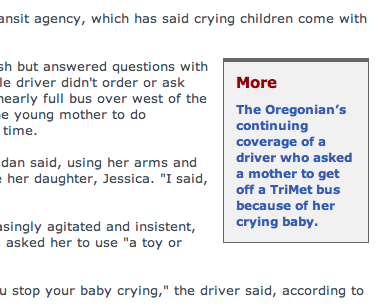 Some of the comments on the Oregonian article were… actually rather surprising. A few people didn’t seem to think this was that big of a deal, saying that the cyclist was “obviously stopping” and “would have waited for the train to pass if the driver had not chosen to stop”, and others feeling that this story was unfairly targeting cyclists. Unsafe behavior around the trains is not limited to cyclists. I have seen plenty of stupid actions by people on foot, by people driving cars, and yes, people on bikes. This particular incident wasn’t targeting cyclists, however it was a recent event where people on a train were injured, and a cyclist happened to be the cause. Oblivious people are going to do stupid things around trains regardless of what form of transportation they use. In this case, it was a cyclist. Tomorrow it might be something else. I’m not going to say this guy is representative of all cyclists, but I will say that he’s representative of the boneheaded things people do around the trains. As for this not being that big of a deal? 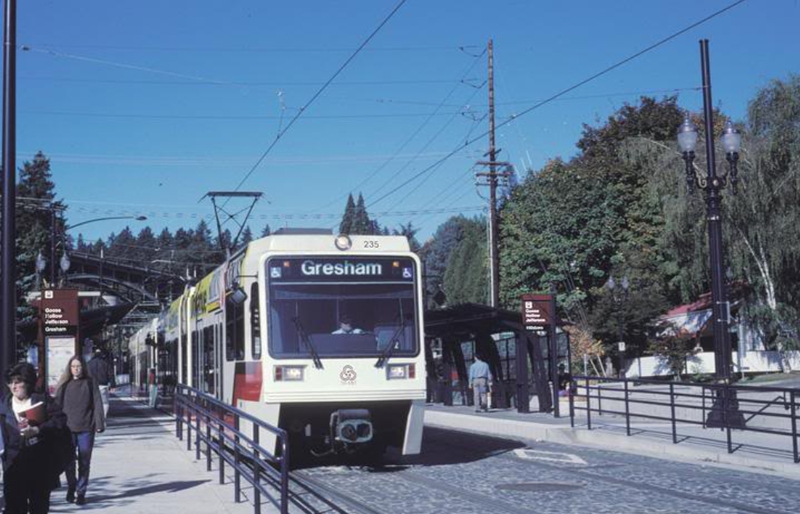 With all due respect, you watched a video in an article titled “Bicyclist prompts emergency MAX train stop in Gresham.” You knew what this video was going to show and you were watching for it. And that’s sort of like watching Titanic where you know what’s going to happen (SPOILER ALERT: The boat sinks) so it’s not a surprise when you see it. But consider this from the operator’s perspective for a moment, who didn’t know that this was going to happen at that intersection. As an operator, you are aware that every single time you pass a train stopped at a platform on the mainline, there is a chance that someone is going to run around the back of it into the path of your train. You also know that cars waiting to turn left – like the one in the video – might run that light. So you reduce your speed (as the operator of that train did) because of those chances, but you never know that this intersection is going to be the one where someone darts out in front of you. But when it happens, you are going to brake hard to bring the train to a stop to avoid hitting them. So the view you see in the video shows the cyclist – who you were expecting to see – likely before he entered the field of vision of the operator (who was not expecting to see him). And yes, suddenly seeing someone heading into the path of your moving train is a big deal. People have been killed doing the exact thing this cyclist did. To state the obvious, trains don’t swerve. You have a split second to react and hit the brakes when you see someone who isn’t paying attention and is on a collision course with you, and that’s all you can do – you’re not going to keep going, assuming that they will stop. 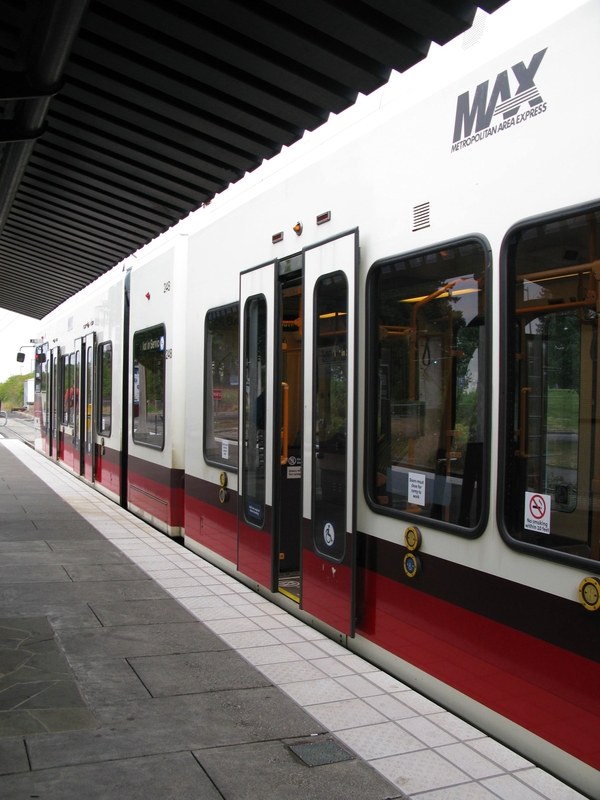 To the person who said to train MAX operators not to use the emergency brake… are you serious? 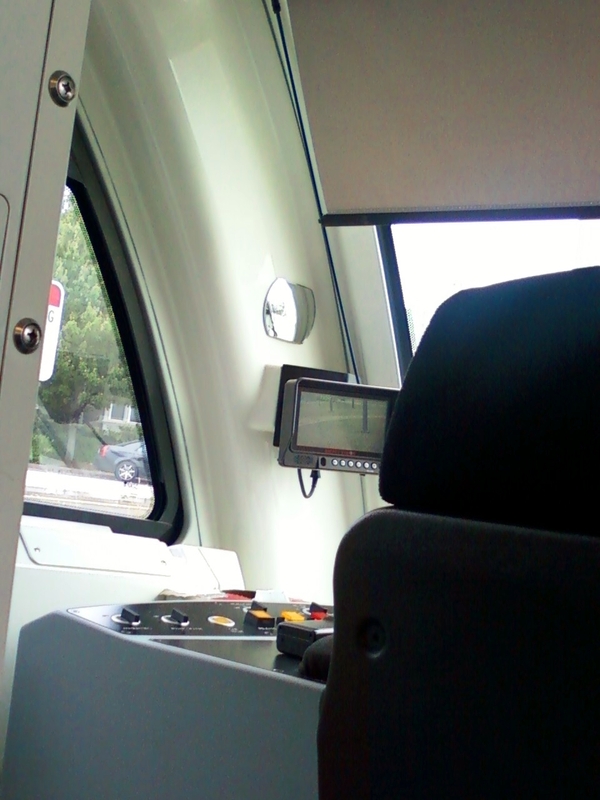 Emergency braking on the Type 4s is explicitly covered during Type 4 training – when I did mine a few years ago, we took a 4 onto the test track at Ruby, brought it up to 35 mph, and used the emergency brake to practice both using it and recovering out of it in a controlled setting before encountering situations like this. And yes, the emergency brake is a hard stop, even harder if you’re using it at a low speed. But what other option is there? Run the risk of killing someone who isn’t paying attention? Operators are not mind readers. I see a cyclist heading on a collision course with a train, and my instinct is to stop the train, not to assume that he’s going to wait for me and then cross behind the train. I can’t tell if he’s obliviously ignorant or intentionally suicidal, but I’m not going to waste a lot of time mulling it over, I’m going to do what I can to not hit him.You don’t put your faith in someone incapable of obeying a red light/don’t walk sign to have the intelligence to get out of the way. 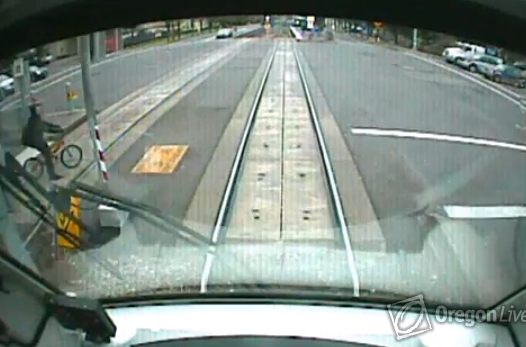 Some people suggested putting up mirrors in areas where the view of a train might be obstructed. Those are already in place in a few areas of the alignment, such as the above picture taken at Millikan Way. However, similar to crossing gates, warning lights, and don’t walk signs, these won’t help you if you willfully ignore them. Oh, and one more thing? 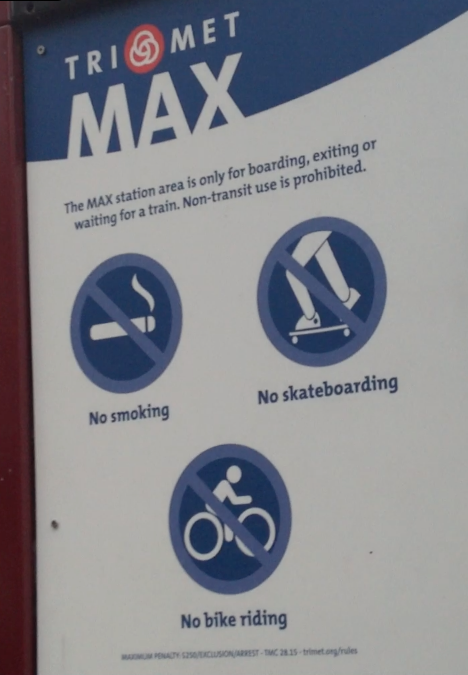 Yeah, riding your bicycle is not permitted on the train platforms in the first place. Had someone been doing code enforcement on that platform at that time, he could’ve been looking at a $175 citation (or more) before getting the chance to put himself – and others – in harm’s way. Not that I’m the kind of person to anthropomorphize the MAX cars, but if I did I would totally pity car 235, who’s like the poor guy that always happens to be in the wrong place at the wrong time. 235 is a little different – it could almost pass for a type 3 as it’s the only 2 that’s rocking the new TriMet blue and yellow color scheme that all of the type 3s are painted in (though one side of it has had an ad for a while), and the mirrors are still those of a type 2. 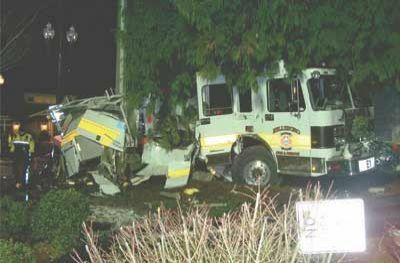 But then, one day in 2005, 235 had a tangle with a fire truck in Hillsboro. It sustained severe damage in that crash. 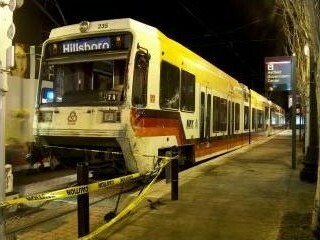 235 was repaired and re-entered service. 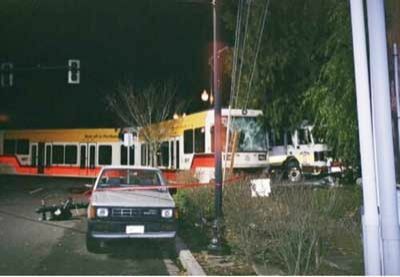 As far as I know, it had a relatively uneventful life after that, until a few years later, when it was the trailing car of the train that derailed at 11th Ave.
Well at least it wasn’t the lead car? And then yesterday, a semi-truck loaded with cars crashed into 235 at 10th and Washington in Hillsboro. I’ve heard the operator is ok. It also was not his fault, which is also good news, and as far as I know the damage to 235 wasn’t too bad, aside from the windshield. But we can rebuild it. We have the technology. Did this really need multiple stories? …where was any media coverage of Joel preventing a fatality? 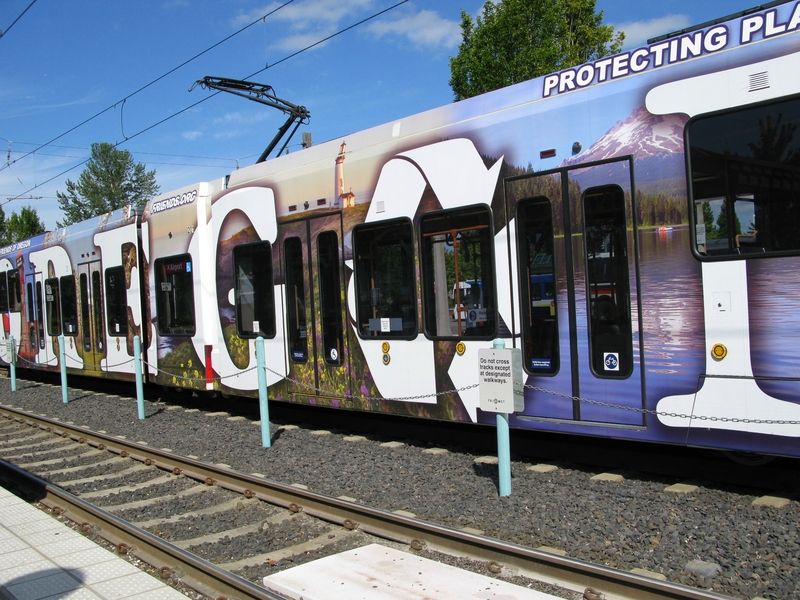 Don’t get me wrong, I’m thrilled that this is at least getting internal recognition at TriMet. 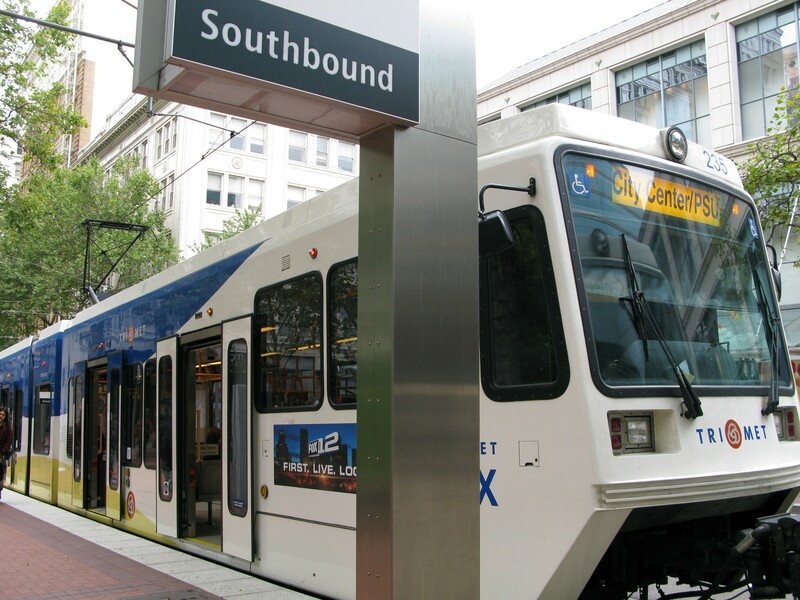 Donna said it, I’ve said it (more than once), and now Joel, and who knows how many other operators that I just don’t have links for – TriMet bus and rail operators really are saving lives every. single. day by compensating for the poor attention of / decisions made by the public around the buses and trains. 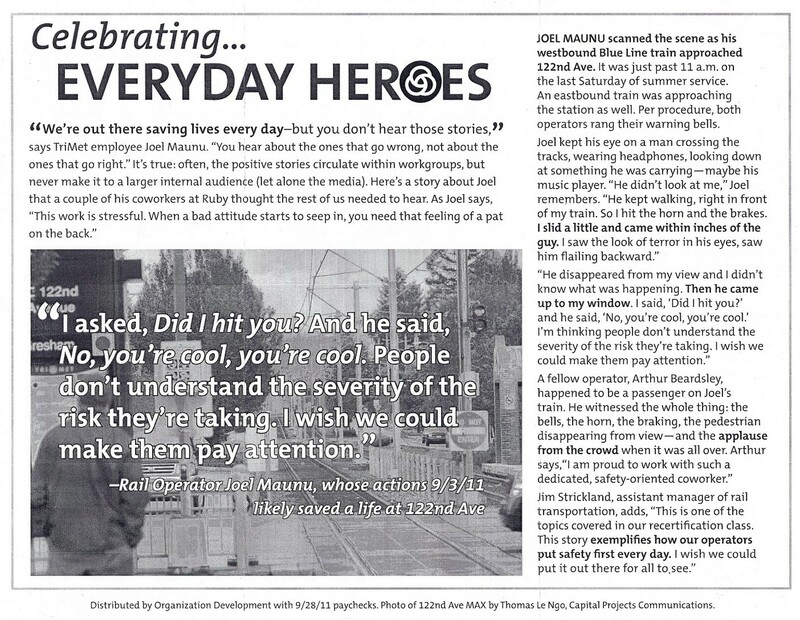 This is not news to any operator, but it’s nice that this was distributed to other TriMet employees who don’t see it the same way since they’re not out in the field. 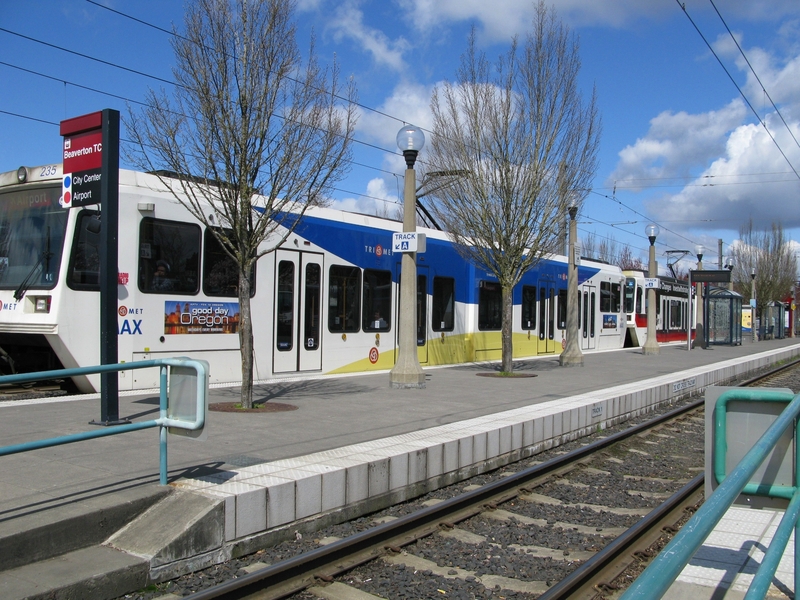 But Joel is right – if an operator does something stupid, there’s no end to the media coverage of it, and no official support from TriMet in the media for the rest of the operators who do their jobs, and do them well. 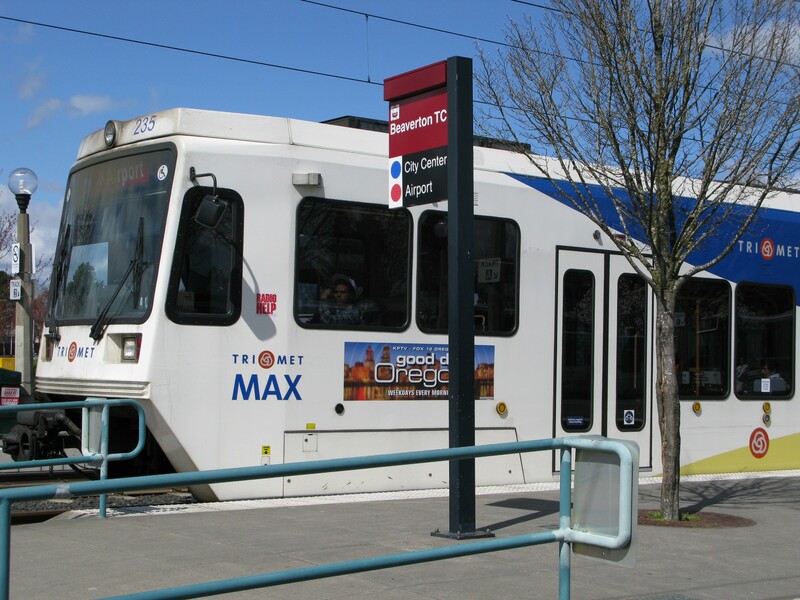 The fact that operators prevent hundreds of horrific accidents every day, well, I guess that doesn’t sell as many newspapers as “look at the dumb thing this bus driver did!” TriMet bus ridership averages around 61 million boarding rides per year, the overwhelming majority of which DON’T make the news. Then one woman in August and another in September had negative interactions with bus operators when their small children were being fussy, and now somehow it’s fair that the public is viewing all bus drivers as baby–haters? I wish we could put it out there for all to see. 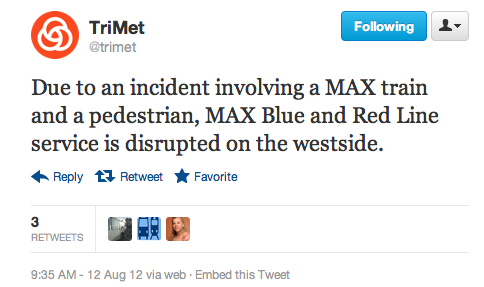 Gee, if only we had some sort of communications director at TriMet, perhaps someone with contacts in local media agencies, who could take on this role of putting it out there for all to see since it’s true, these sort of preventative incidents happen at a much higher rate than any corresponding media coverage. Too bad we don’t have-oh wait.